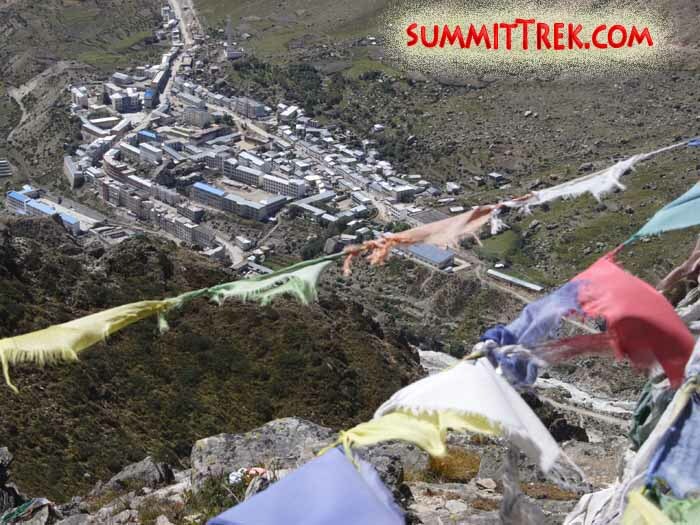 Hi, this is Dan Mazur calling a dispatch for the SummitClimb Cho Oyu expedition for the 27th of May. Our team woke up today in camp 1 after a very difficult night with a lot of winds. We took down the camp, together with our sherpas. Then we walked down and the sun came out. It was a really long and tiring walk through the glacial moraine on some super snowy trails. There has been quite a bit of snowfall here. Along the way our kitchen boys came up from ABC carrying some juice, which was delicious. We finally arrived back in advanced basecamp in the afternoon and had some delicious meals, like omelets and food that we’d been craving. We had a big farewell dinner in the afternoon with our entire team back together. The team talked about our memories of the trip and what a great expedition it was, although not without some big challenges, but safe and successful, and how much we enjoyed meeting everyone in the group and getting to know one another, as well as building ourselves into a team that functioned well. We’re ready to go home now. It’s the end of our expedition. Our yaks are coming tomorrow. We’re missing all of our family and friends and excited to see them soon. We hope to be in Nepal tomorrow or the day after tomorrow. Hopefully we’ll be in Tingri tomorrow night and Nepal the day after tomorrow. We will also hopefully be able to be on email and be able to use our SMS and text messages on our phones. Stewart Barbour made it to the summit plateau but did not go to the very top. Congratulations everyone! Above the snow step headwall leading to camp 3. 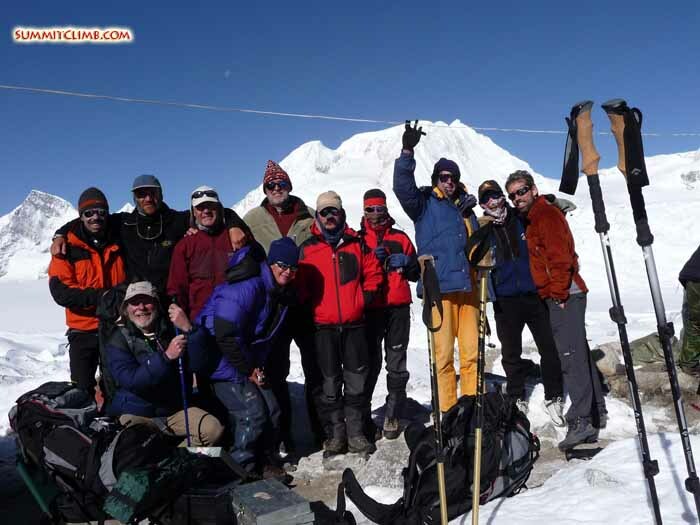 Our awesome 2009 Cho Oyu team in advanced basecamp. 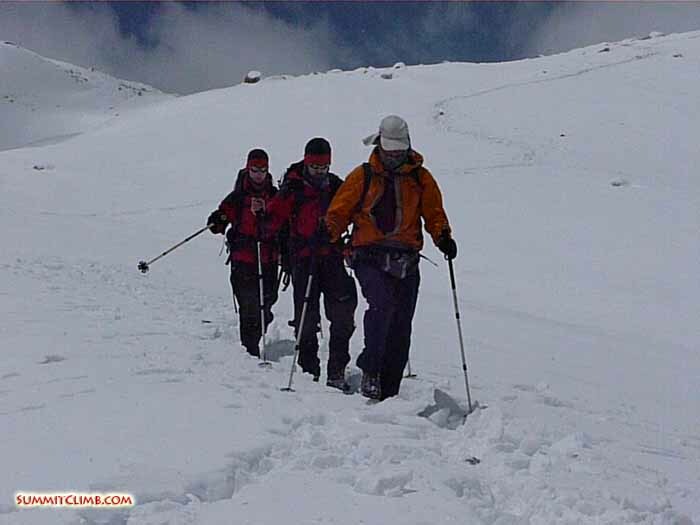 Our team climbing up towards the summit (Stefanos Voutselas). 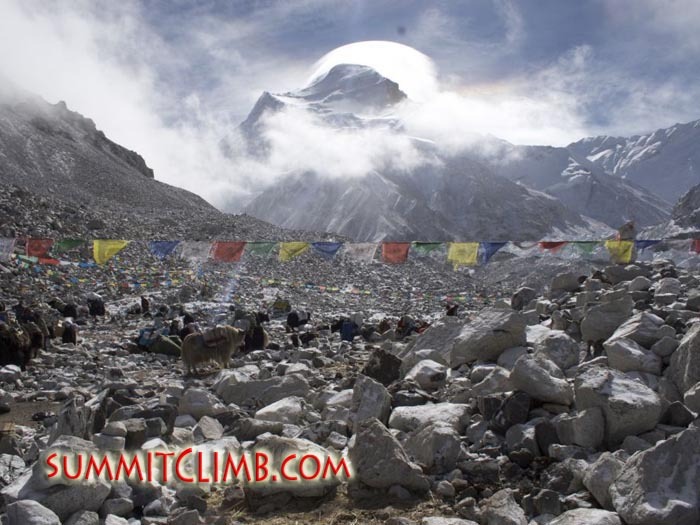 Hi, this is Dan Mazur calling in for the SummitClimb Cho Oyu expedition for the 26th of May. Today was a really difficult and challenging day. 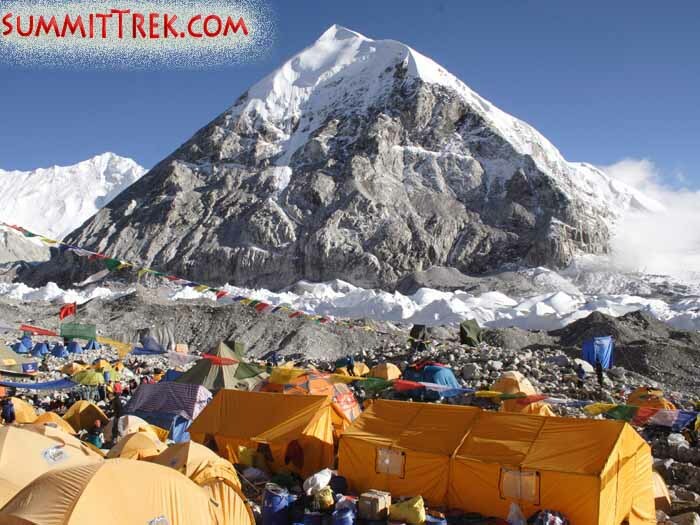 The members and the sherpas woke up in camp 2 and some of them were very tired from several summit attempts and some were tired after coming down from the top. The weather was extremely bad, as it has been for the last couple of days, with lots of wind and heavy snows. 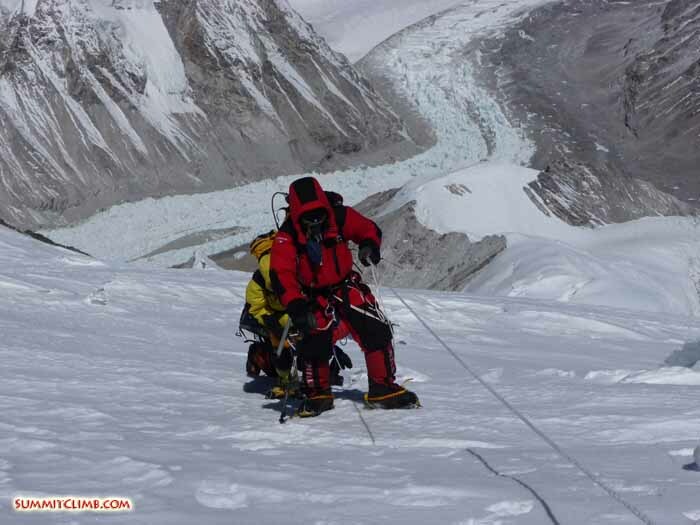 The team started descending from camp 2, trying to get down to camp 1. They were heading down the ropes on the steep sections. There was blue ice and steep snow between camp 2 and camp 1. You can imagine the difficulty in trying to descend those ropes during full whiteout conditions. Luckily they were able to find the way down safely. Three sherpas went up again with the mission of finally closing down camp 2, packing it up and carrying it down. Those sherpas were hit by an avalanche which crossed the path of the ropes and tore out the ropes and actually threw one of the sherpas 100 metres and another 20 metres. Thank God none of those sherpas were seriously injured, although they were very shaken up. They decided to definitely return to camp 1 and not go to camp 2 today. We’re all thankful that everyone is okay. Hi, this is Dan with a dispatch for May 25th. It’s about 11:15 in the evening. I’m calling from camp 1 at 6400 metres/21,000 feet. Today we broke camp 3 and all of the members and sherpas worked hard to get down to camp 2 in some really tough weather. It was snowing a lot with heavy winds and a lot of our tents had been buried by snow. We had to dig them out. Everybody is doing well. 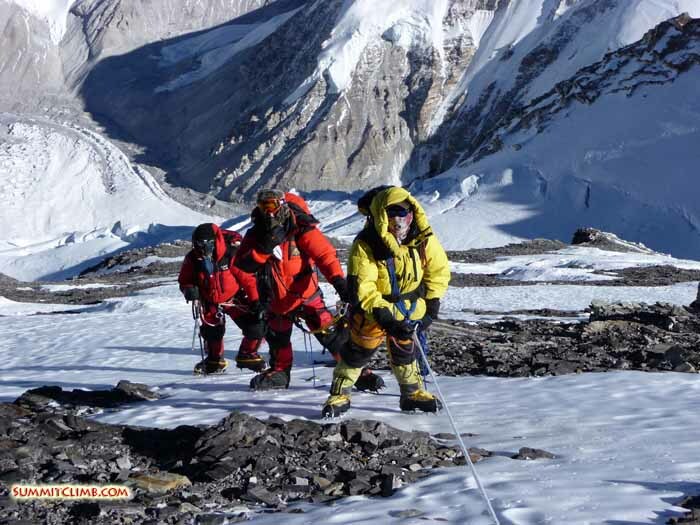 In addition, several members tried to make a summit attempt leaving from camp 3, but were turned back by extremely high winds at the rock band. I would like to give them that extra recognition because they were a group of members who were trying to go without oxygen. 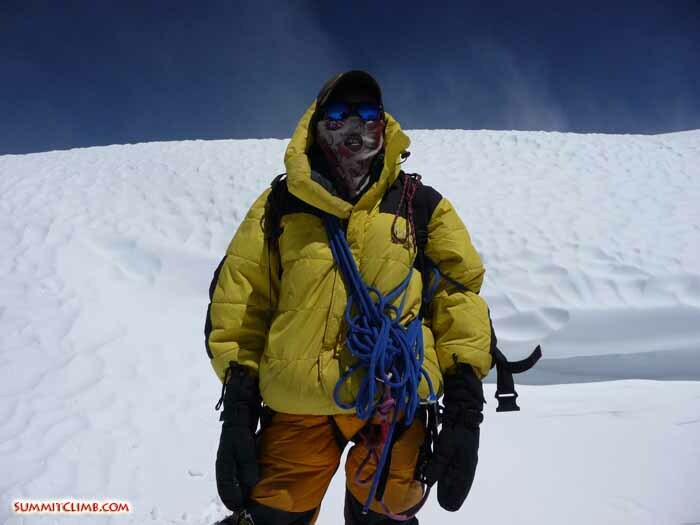 Mark Delstanche near the summit of Cho Oyu. Climbing the headwall to camp 3 (Stefanos Voutselas). Update: Team safely down in camp 3 and camp 2. 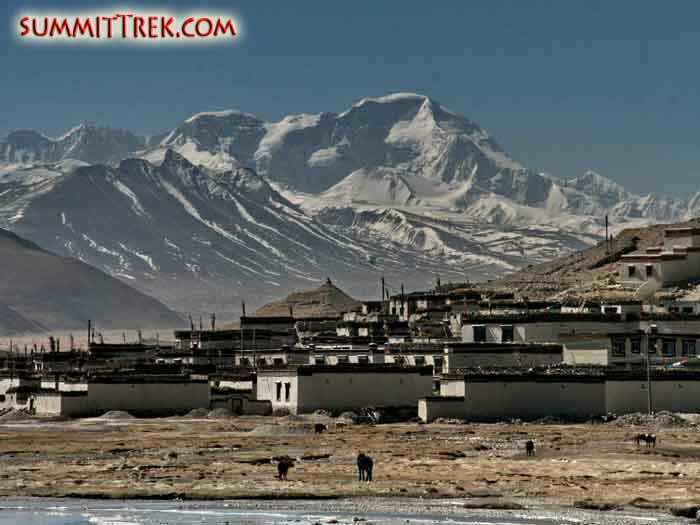 Hi, this is Dan again calling in for the SummitClimb spring Cho Oyu expedition. Stefanos on the summit of Cho Oyu. Dan, Mark and Stefanos on the summit. Team descending. Team member walking towards the true summit of Cho Oyu, where you can see Everest when you're finally there (Stefanos Voutselas). It’s Sunday at 3:30 in the afternoon and we’re on the summit of Cho Oyu. It’s very windy up here and we can see Everest, so that’s how we know we’re on the summit. We can look out and see the Tibetan plateau. It’s a blue sky day with quite a bit of wind. Thanks for tuning in and we’ll call you when we get back down to camp 3. All right. Bye for now. 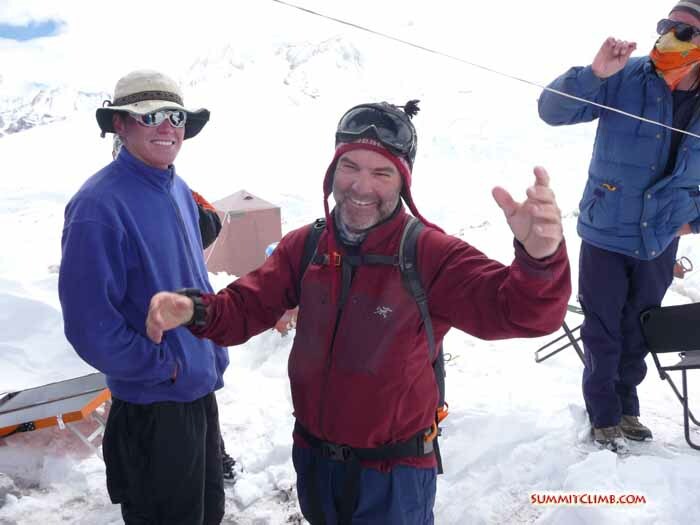 Hi, this is Dan Mazur calling in a dispatch for the SummitClimb Cho Oyu expedition on Sunday, May 24th at about 5:00 a.m.
Camp 3 at 74500 metres/24,600 feet. In the centre left of this photo you can see Shishapangma, the lowest of the world's 8000 metre/26,000 foot peaks. On the right side of this photo the Tibetan plateau is visible (Guntis Brands). 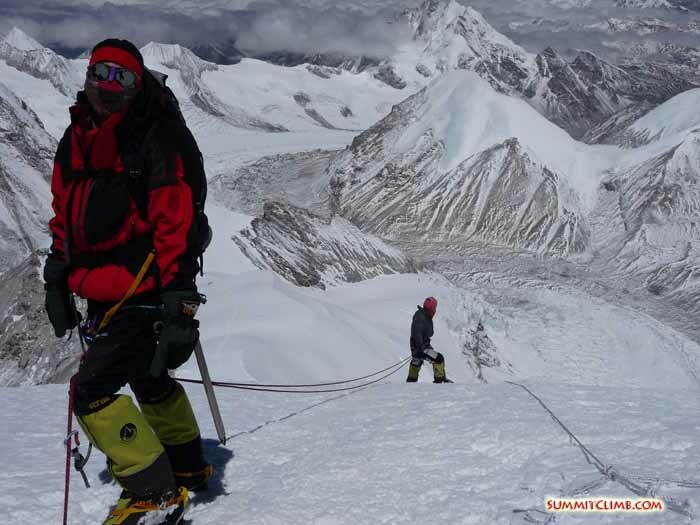 Hi, this is Dan Mazur calling in a dispatch for the SummitClimb Cho Oyu expedition on Saturday, May 23rd at about 9:00 p.m.
Last big storm cloud over Cho Oyu (Samuli Mansikka). The famous view from the summit (Samuli Mansikka). Hi, this is Dan Mazur calling in a dispatch for the SummitClimb Cho Oyu expedition on Friday, May 22nd and the time is 8:50 p.m.
All of us are up here in camp 2 at 7140 metres/23,400 feet. That’s all of our members and all of our sherpas. We’ve taken a rest day today to wait for better weather. 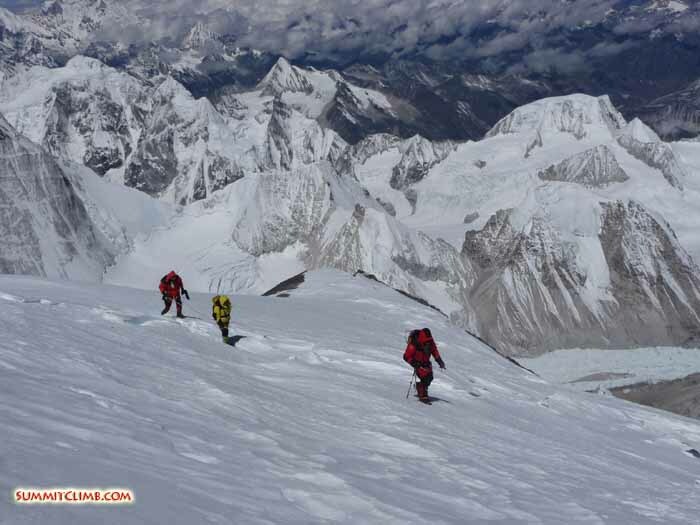 We hope to climb up to camp 3 tomorrow, weather permitting, and then head for the summit. 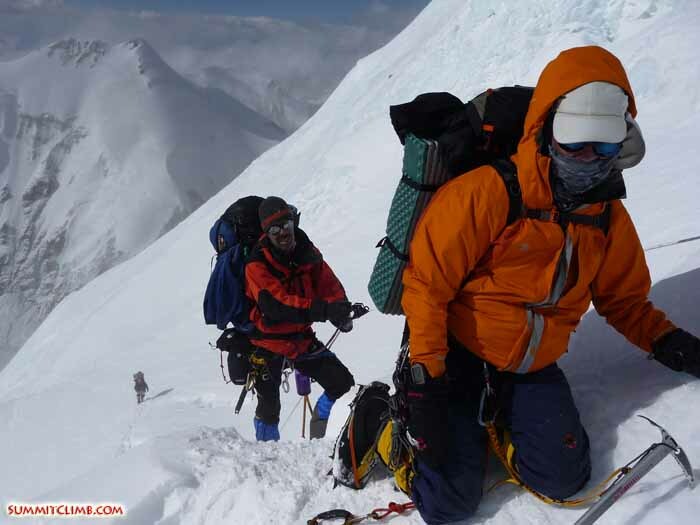 It’s hard to believe only 2 people have climbed Cho Oyu this season out of maybe a dozen teams on the mountain. Some of those teams have been here since the early part of April. The weather has just been a bit windy and fickle and changing frequently. We congratulate those 2 people and we’re hoping to follow in their footsteps tomorrow. 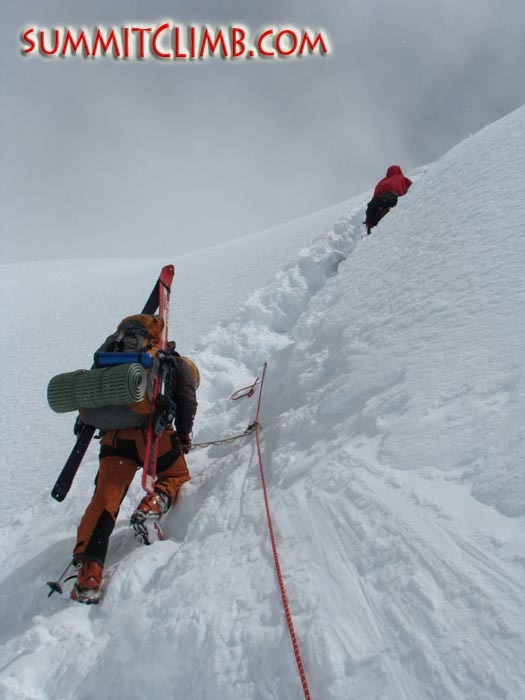 Climbing the headwall to Camp 3 at 7,500 metres/24,600 feet (David Lepagne). 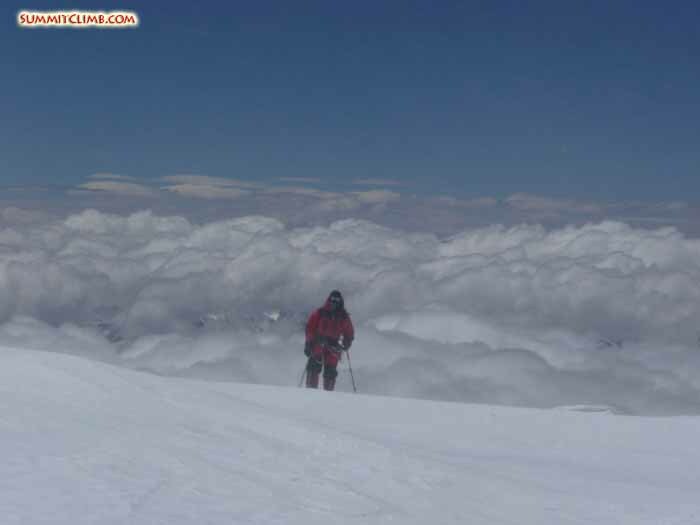 Hi, this is Stefano Ricci reporting for the SummitClimb spring Cho Oyu expedition 2009. I’m calling from camp 1 at 6400 metres/21,000 feet on 20th of May at 8:00 in the evening. We left ABC this morning and ascended slowly, trying to save energy. Now we are resting in our tents and waiting for dinner because, amazingly, we have a cook in camp 1, which is really incredible. 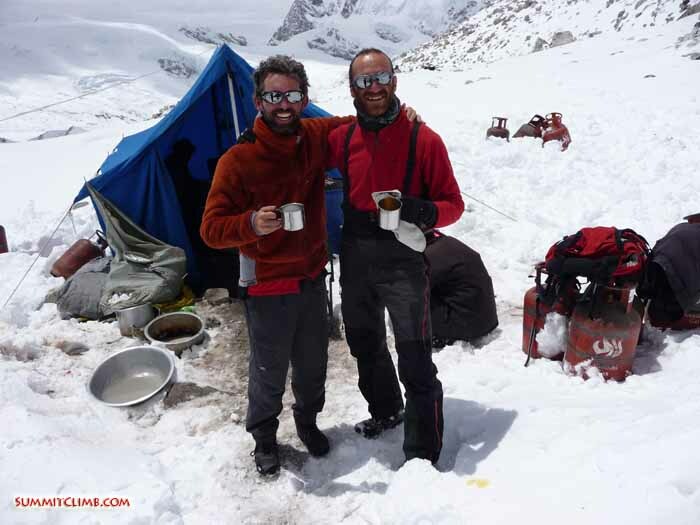 Members in Cho Oyu advanced basecamp (Stefanos Voutselas). 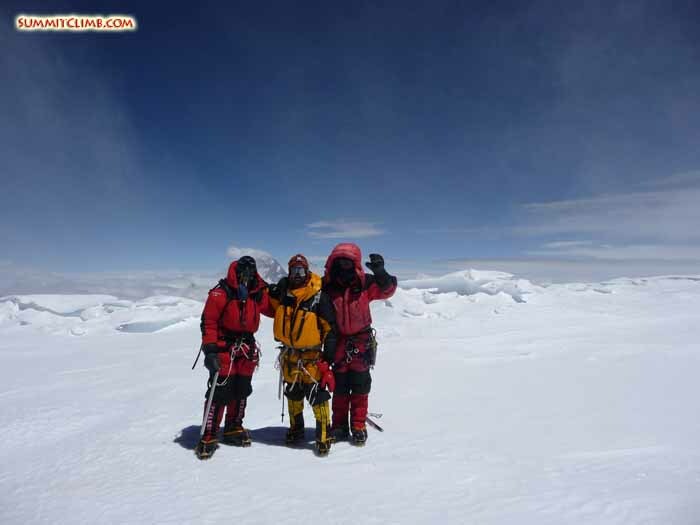 Hello everyone, this is Eva Ruszuly reporting in for the SummitClimb spring Cho Oyu expedition for 19 May, 2009 in ABC. We had a big surprise from our Nepalese and Tibetan cooks. They prepared us a great dinner and then afterwards brought out a big delicious cake. Wow! We are about to begin our summit attempt. We will head for camp 1, camp 2, and then camp 3. 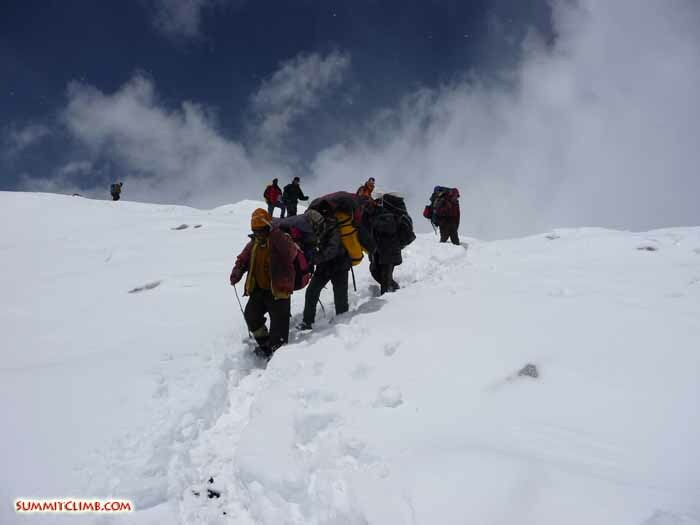 Hopefully on 25 May, we will summit Cho Oyu. Right now we are just taking a bit of a rest before the big push. Team descending. One of our awesome sherpas (Stefanos Voutselas). Hello, this is Mark Delstanche reporting for the SummitClimb spring Cho Oyu expedition on Saturday, 16th of May. We came up to camp 2 yesterday from camp 1 and it was the hardest day of the expedition so far. It was a long day, pretty tough, and everyone arrived fairly tired. It took between 7 ½ - 11 hours. It was pretty good most of the way, with a little bit of a storm in the afternoon. We’re now up here, relaxing and acclimatizing after having accomplished quite a stroll. We’re now at 7100 metres/23,300 feet and we’re almost halfway through the expedition. It’s obviously the time where we’re now counting down the days until we’re back to our home luxuries, which we’re all looking forward to. Personally, I’m looking forward to sitting down on a proper toilette, a good few pints of beer with my friends at the pub back in England, a full English breakfast, and of course seeing my girlfriend. Urs has been great. He’s my tent buddy helping me up on the high mountain. 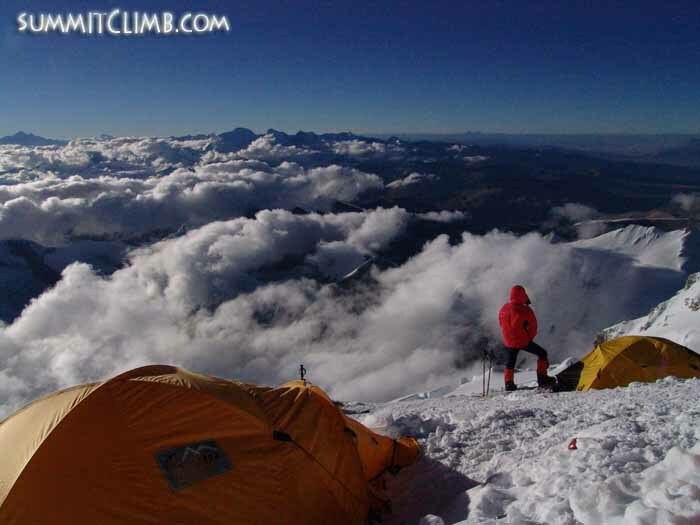 This is Zsombor Tulit reporting for the SummitClimb spring Cho Oyu 2009 expedition on the 14th of May. Yesterday we had a very long day, getting up very early in the morning and practicing using the stoves. 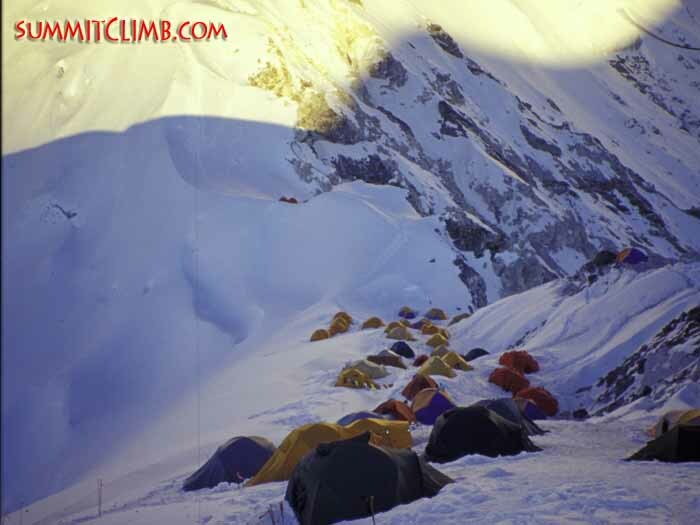 The whole team reached camp 1 between about 5-6 ½ hours. Here in camp 1 everything is perfect. We have a great cook, Dorje Lama, who has prepared us delicious big dinners and breakfasts so far. Today is a big day. We are approaching camp 2. The weather is perfect with just sunshine and no wind at all. There are a great line of climbers approaching camp 2 from where I am right now. 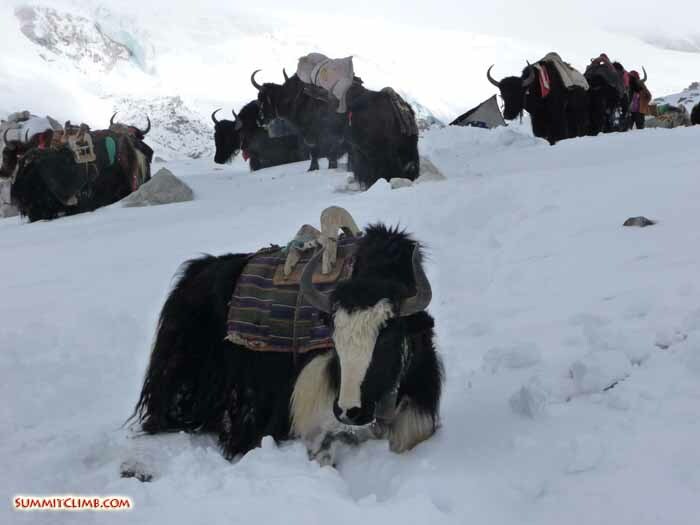 Yak trains bringing equipment into base camp. 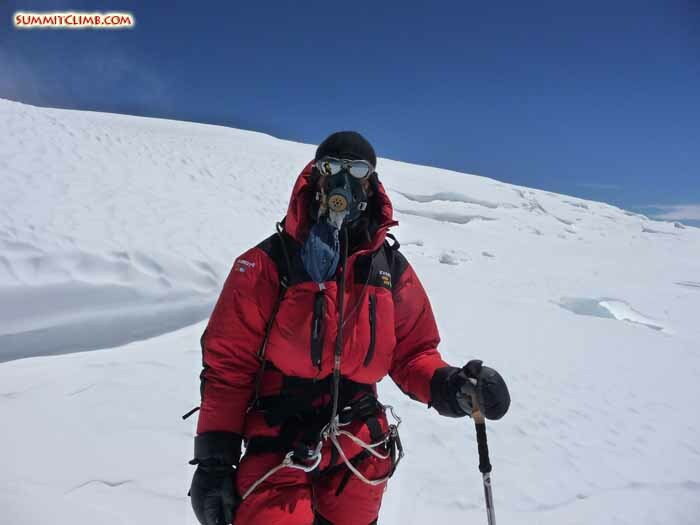 One of our awesome sherpas on the summit of Cho Oyu (Stefanos Voutselas). 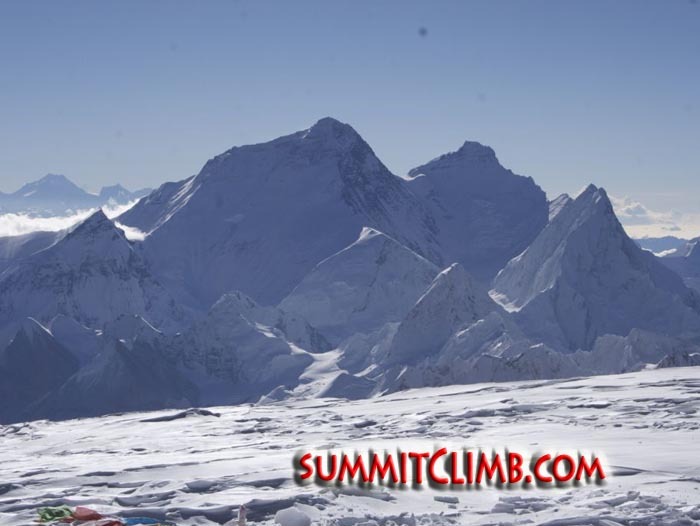 Hello, this is Rick Wilkerson reporting in for the SummitClimb spring Cho Oyu expedition on May 13th. We awoke to another day of new snow fall. I believe that’s the 3rd day in a row. It quickly cleared and the skies were blue and we had a very nice day. This was a rest day that included not only resting about the camp, but also getting equipment ready to move to camp 1 tomorrow. The day also included some medical training on the use of the Gamow bag for patients with acute pulmonary edema, as well as instruction on how to use the oxygen masks and oxygen system. 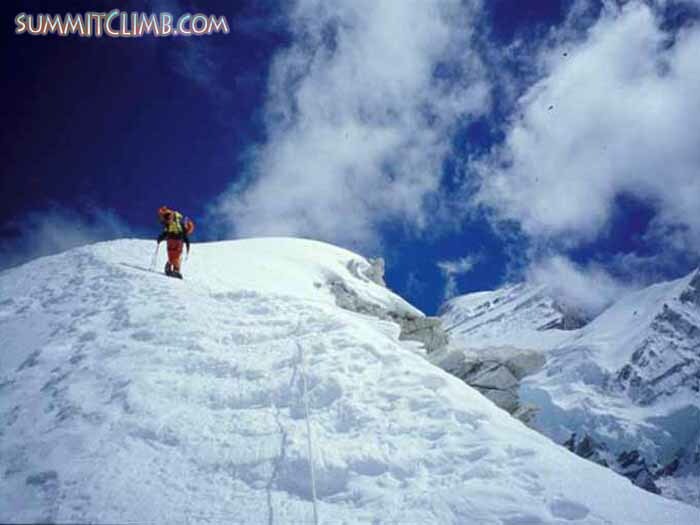 Climbers ascending above camp 1 (in the distance below) up to camp 2 (Arnold Coster). 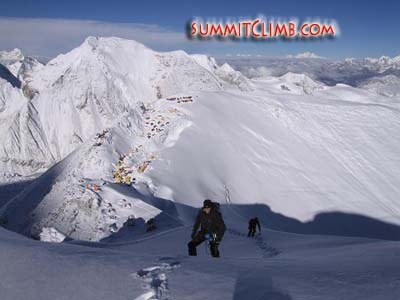 This is Zsombor Tulit reporting for the SummitClimb spring Cho Oyu 2009 expedition on the 12th of May. The whole group is in ABC. Yesterday we had a hard day coming down from camp 1. There was a big snow storm in the morning. In some places the fresh snow was 70-80 cm deep. It was difficult to find the trail from half camp to ABC, but we persevered and arrived at ABC at 5:00 p.m.
Our friendly and hard working high altitude porters bringing equipment off the moutnain. Our sturdy and hard working yaks taking a short break (Stefanos Voutselas). 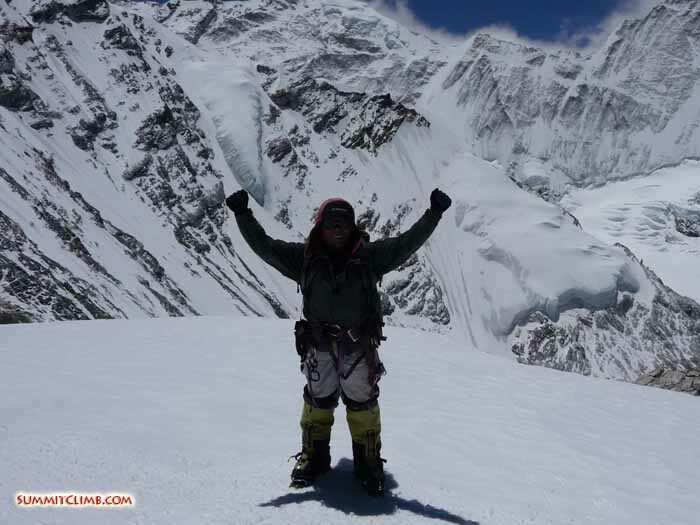 Hi, this is Urs Jaeggi calling in for the SummitClimb Cho Oyu 2009 spring expedition. I’m going to give you a recap for the 10th and 11th of May. Most of the members are back in ABC now at about 5700 metres/18,700 feet. The weather today has been pretty nasty, with a lot of strong wind gusts and snow fall, so we’re in our comfortable safe haven at ABC. Yesterday the weather was a bit smoother, but in the afternoon a lot of wind kicked up and the temperature dropped. Most of the members made it up to the ice-wall between camp 1 and camp 2, which is roughly at about 6730 metres/22,100 feet. 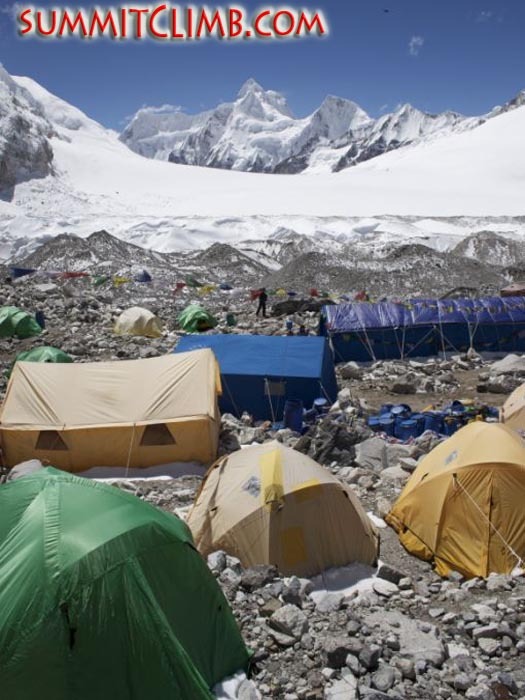 The team has also spent 2 nights sleeping up at camp 1 getting acclimated now. Hi, this is Stewart Barbour of Northern Ireland reporting for the SummitClimb Cho Oyu spring 2009 expedition on the 9th of May. We have climbed from half camp to camp 1 at an elevation of 6400 metres/21,000 feet. We climbed the ‘horrible hill’, a very steep scree slope requiring 2 steps up, 1 down. We were all in good shape under the expert guidance of our leader Dan, who has been particularly helpful and encouraging to the elderly. 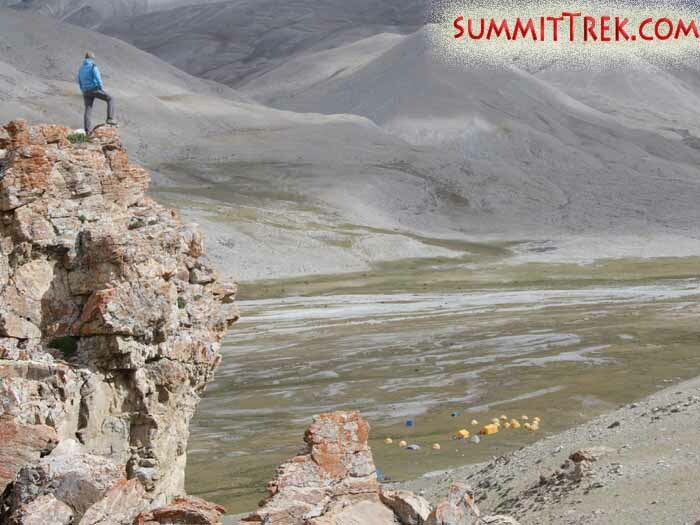 Hi, this is Martha Johnson calling for the SummitClimb Cho Oyu 2009 spring expedition. Today is May 8th and we are at 6000 metres/20,000 feet at the half camp between ABC and camp 1. We are here with 6 members from our expedition. 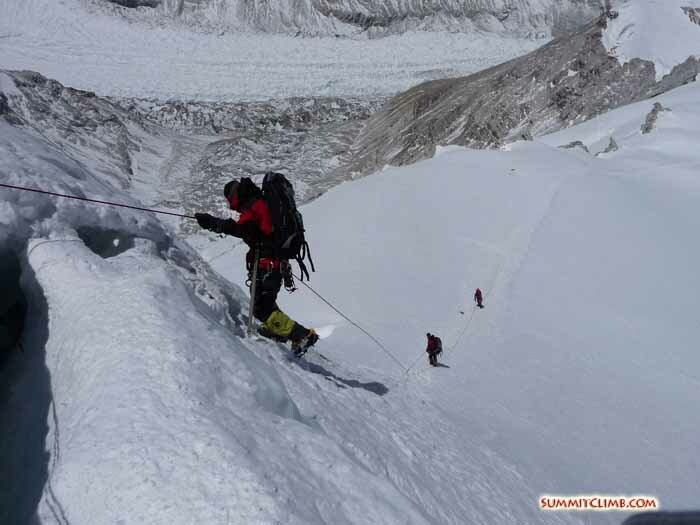 The sherpas are up higher making camp 1 and also camp 2, as well as working on the route. There are a few members down in ABC. Stefano and Stefanos made a round trip from ABC to camp 1 and back down today. They really enjoyed that. Eva and Zsombor are in ABC and thinking of coming up tomorrow. We had a lovely walk today with beautiful weather. Right now it’s lightly snowing and we look forward to going to camp 1 tomorrow. Hello, this is Stefano Ricci calling in a dispatch for the SummitClimb Cho Oyu 2009 spring expedition on 6th of May. 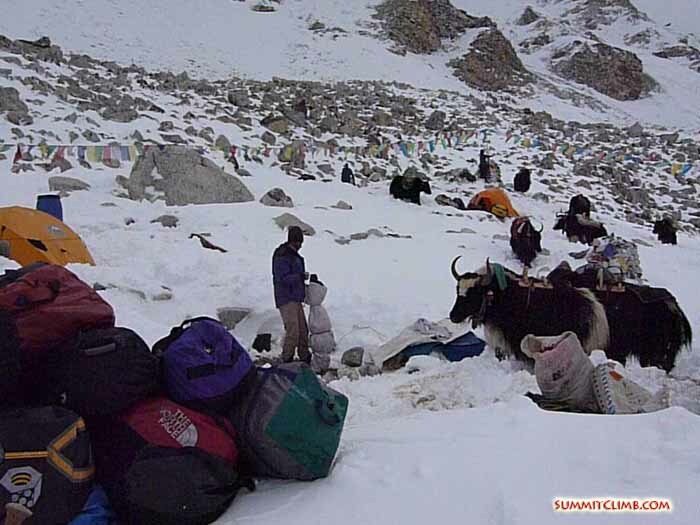 I’m calling from advanced basecamp at about 5700 metres/18,700 feet. On the 5th of May, some members decided to walk halfway to camp 1 at about 6000 metres/20,000 feet for acclimatization, while other members decided to take a rest day at ABC. Today we went with our leader, Dan Mazur, to practice ice climbing and check the equipment. There was a nice steep wall of ice about 20 metres tall and we practiced using a jumar, ice climbing, and rappelling down on ropes. The weather has been very nice, with clear skies. Yesterday we could almost see a full moon rising behind Cho Oyu, which was just beautiful. The temperature at night is cold at around -10 C/14 F, but very pleasant during the daytime, which is around 10-15 C/50-60 F, with a very light wind. Today we also had a puja, which is a Buddhist ceremony, this morning to bless everybody for a successful climb. It was very nice. They put Buddhist prayer flags all over, prayed and gave us flowers to be blown in the wind. The Tibetan yak drivers were singing and dancing and we all loved it. It was really cool. There is no snow or rain in ABC and it is very dry. Every member is in good condition and the staff is doing a great job. The food is excellent. Our sherpas have already gone up to camp 2 to fix ropes. Some members are planning to go all the way to camp 1 tomorrow morning, which is at about 6400 metres/21,100 feet, and back to ABC in the same day for acclimatization. 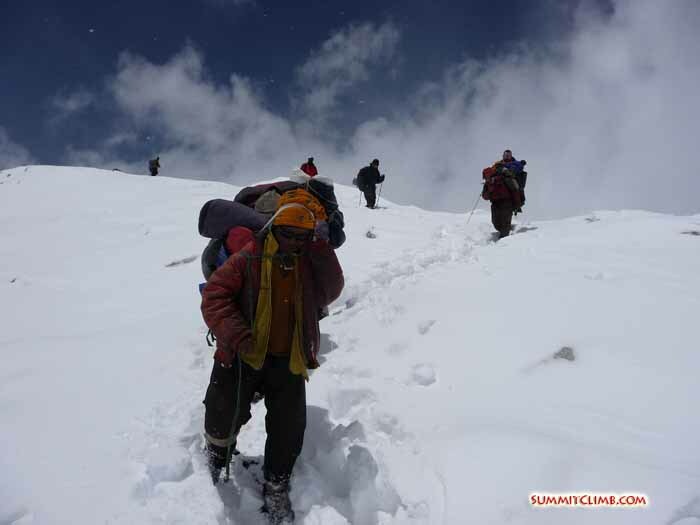 Other members are heading up halfway to camp 1 at about 6000 metres/20,000 feet and will spend the night there. Our comfortable advanced basecamp, located at 5600 metres/18,400 feet (Sam Mansikka). Carrying skis up the first ice-step along the route to camp 1 (Michiel Zuidweg). Hello, this is Stefanos Voutselas from Greece calling in a dispatch for the SummitClimb Cho Oyu 2009 spring expedition on 4th of May. Today we made it to advanced basecamp at 5700 metres/18,700 feet. We started with a delicious breakfast in our intermediate camp and then packed all of the tents and equipments on to yaks for the hike up. Everyone arrived here at ABC by 5:00 p.m.
We have a big camp with 20 tents, in addition to the big group dining and kitchen tents. The mountain looks a bit empty, which is quite a surprise. There are only a few other teams and it is very quiet this year. Our comfortable advanced basecamp, located at 5700 metres/18,700 feet (Samuli Mansikka). 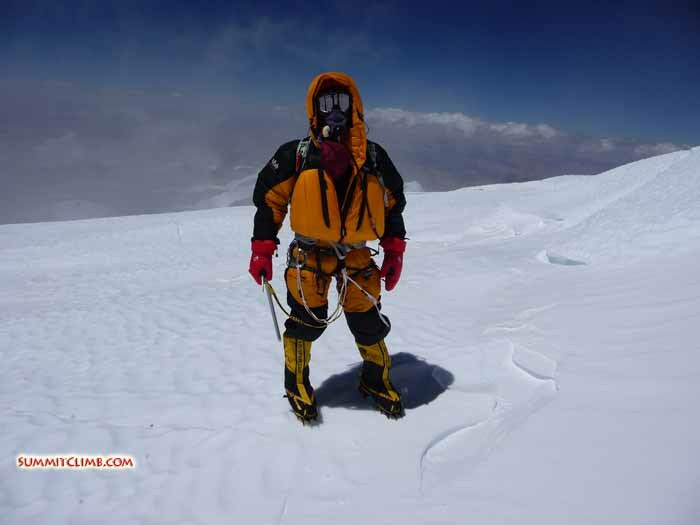 Hello, this is Fernando Urizar from Spain calling in a dispatch for the SummitClimb Cho Oyu 2009 spring expedition. 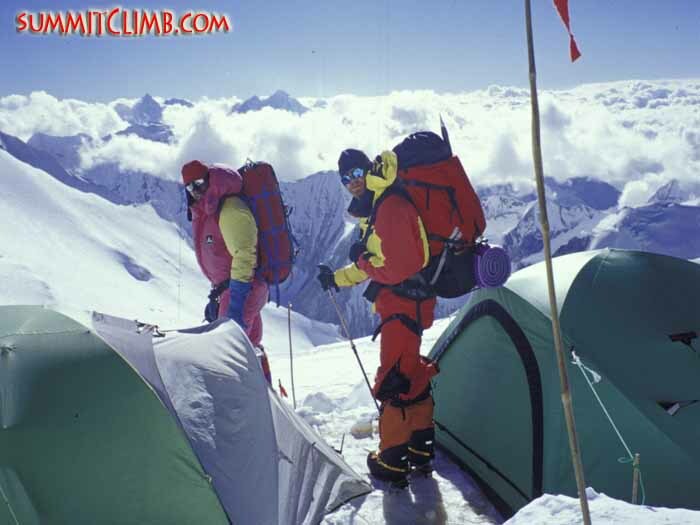 We are in intermediate camp at about 5300 metres/17,400 feet. Today we took a quiet rest day. Members are playing cards, listening to music, reading, and visiting with one another. Hello, this is Conan Bliss calling in a dispatch for the SummitClimb Cho Oyu 2009 spring expedition. Hi, this is Eva Ruszuly from Hungary/Romania reporting for the SummitClimb Cho Oyu expedition. I am very happy to be here. I like the staff, the sherpas, the Tibetan people, and the expedition leader. We are now in Chinese basecamp at 4800 metres/15,700 feet. Everything has been exciting along our voyage into Tibet and beyond imagination. Yesterday we took a bus from Tingri to Chinese basecamp. I relaxed and took a shower after arriving. We have a great team here. Hello, this is Stefano Ricci from the SummitClimb spring 2009 Cho Oyu expedition, reporting in for the 29th of April. The team is in Tingri today. 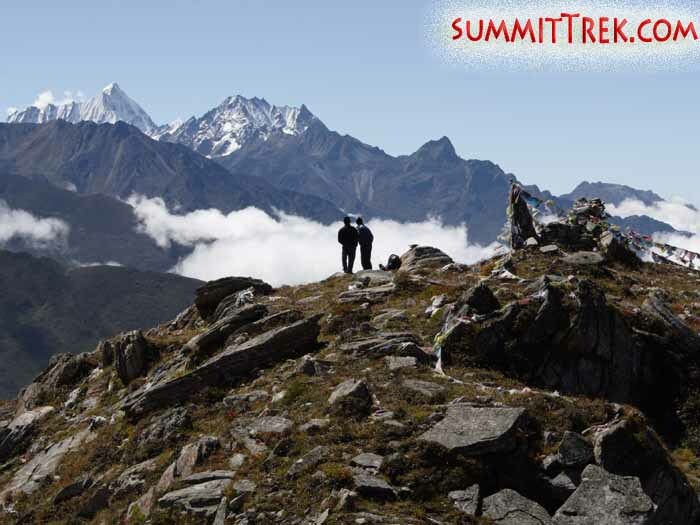 We walked up to a beautiful lookout in the hills, where we were rewarded with gorgeous views of Everest and Cho Oyu. The weather has been great. The members took a rest day today and played cards, walked around and did our last shopping before we head to basecamp tomorrow. Hello, this is Mark Delstanche from the SummitClimb spring 2009 Cho Oyu expedition, reporting in for the 28th of April. We were in Nyalam this morning, where we went for a little stroll in the hills. At about 2:00 in the afternoon we made it over the high pass to the town of Tingri. We had a great dinner after we arrived. Hello, this is Martha Johnson from the SummitClimb spring 2009 Cho Oyu expedition, reporting in for the 27th of April. We crossed into Tibet 2 days ago uneventfully and the customs official said, “Welcome to Tibet”. Team members walking around the local hills of Nyalam (Samuli Mansikka). Today we woke up very early in Zhangmu, had a tasty breakfast, and drove to Nyalam. The road is under construction and we drove past some big rock-slides in the dark. Our vehicles are two, one a very large comfortable air conditioned Toyota bus and the other a large Chinese cargo truck. The road is overall in excellent shape so we are quite well provided for. Upon reaching the 3620 metre high village of Nyalam, we disembarked at the Tashi hotel and had some tea and wandered around town, then had a delicious lunch of tasty vegetables and meat. Then we walked around town some more and sun bathed, read, rested, played cards, and had another delicious dinner. We plan to spend tonight, tomorrow, and tomorrow night here acclimating, before making the drive up to Tingri the day after tomorrow. A view of the town of Nyalam on an acclimatization walk in the hills (Samuli Mansikka). Hi there. We are in Zhangmu for the evening, having crossed into Tibet.